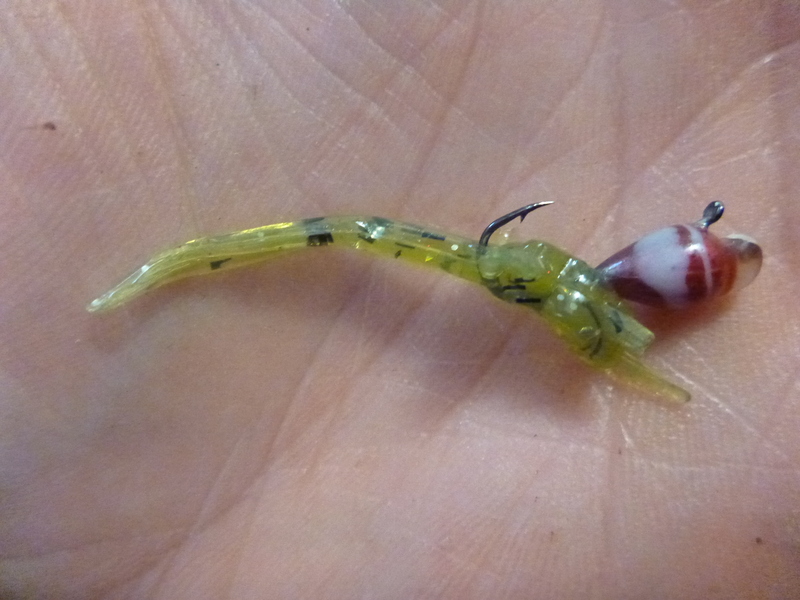 We have had several requests on how to rig plastics for both hard and soft water conditions. I took some time today to quantify my plastics stock and snap some photos of presentations possibilities. Just because this is how we do it doesn’t mean it is right. There are times when fish will eat a bare hook and others when the presentation has to be tweaked just right or else they won’t even touch it. The best strategy is never to settle in a groove. By constantly adjusting color, angle, and size you can keep the fish guessing and possibly find a better option. 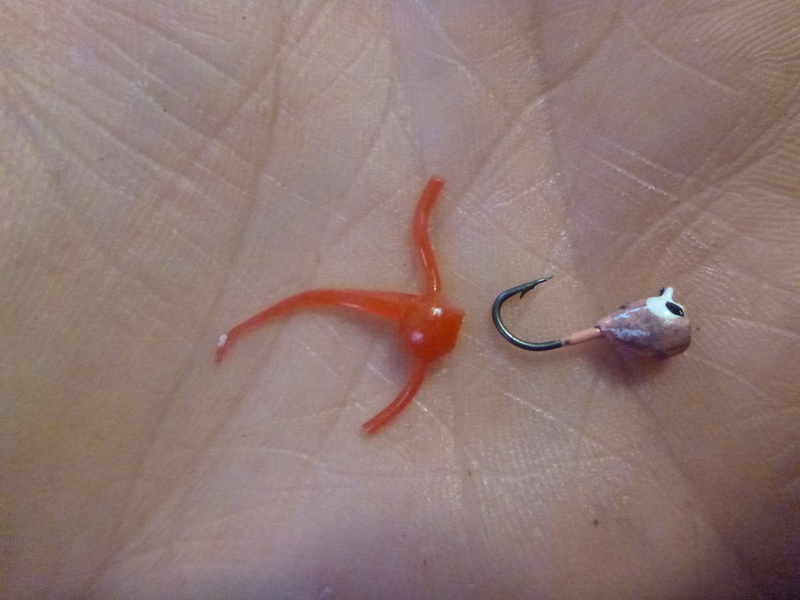 One of my biggest problems with jigs is the length of the hook shank. The shorter the shank is the easier the plastic will fall(or rip) off. 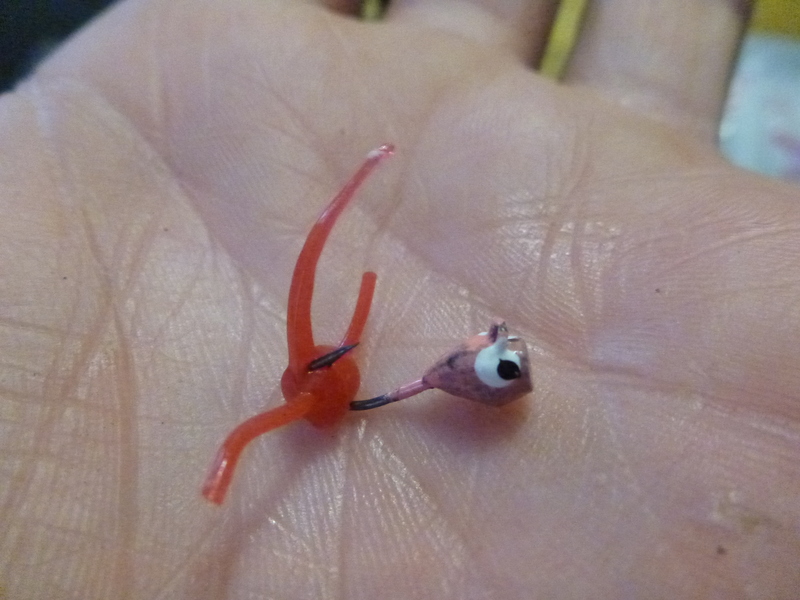 I began fishing plastics on Diamond Jigs and Gill pills. Both are made by Custom Jigs and Spins. 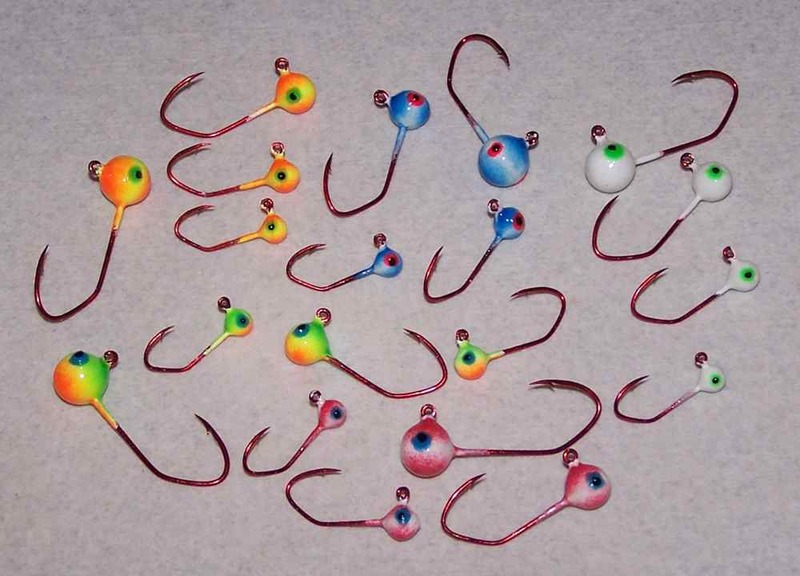 These hooks offer long hook shanks and come in various sizes and colors. I prefer using size 10 and 12 but have both 8 and 14 in my boxes. 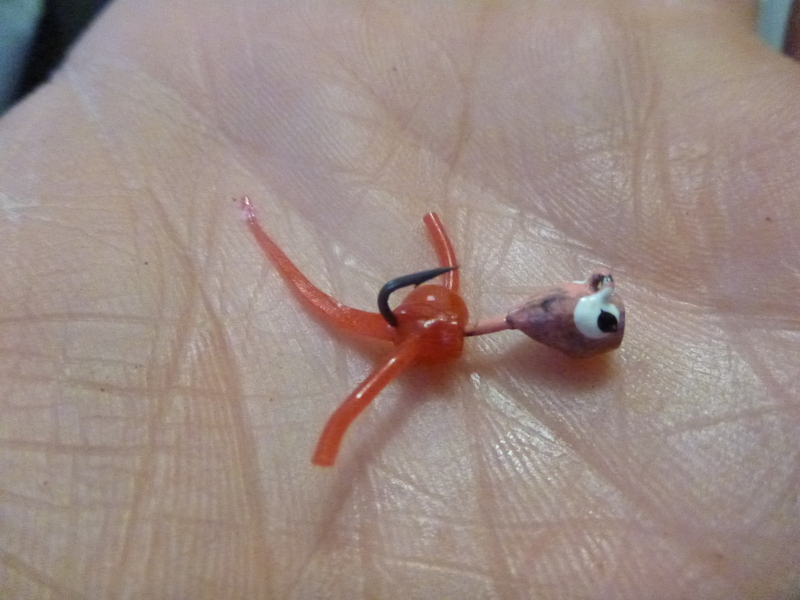 I like smaller presentations for hardwater because in general the search image for a fish is locked in on small bites. 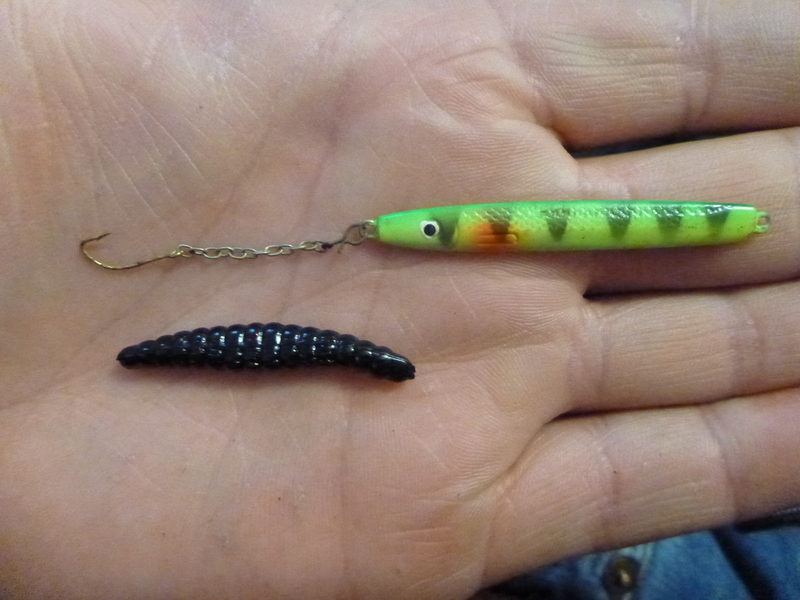 During the spring, summer, and fall months a slightly larger bait is nice because the baits are a bit larger. I begin the majority of my days on the water using a presentation that allows my plastic to be as straight as possible. To set up your bait straight, you run the hook through the tip of the bait and then thread it through the center of the body. I like to go a length equal to the length of the straight hook shank. It may take a few tries but I like to snug the plastic right up to the base of the jig. 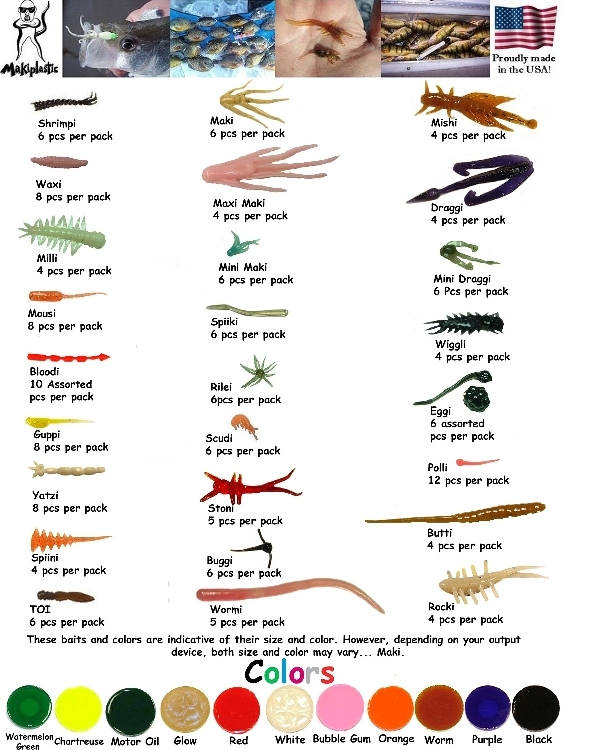 Many micro ice fishing plastics are thin and require hooks with a slim shank. The bait style below provides the fisherman with several options on how to fish it. Because the body on the plastic is so small it important to hook it right through the middle to prevent it from being easily ripped off. 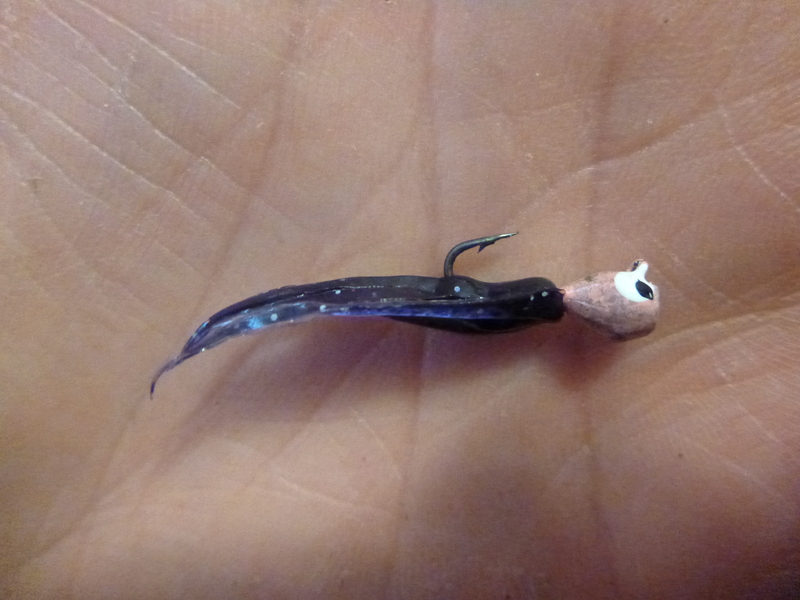 When the fish bite is very light, I like to rig this bait with the middle tail facing upward. The tail is just long enough to fold over under the water pressure when jigged. Drives the fish nuts! As with any other bait, it can also be rigged horizontally and is normally equally effective. A good option for rigging plastics is on sickle hooks. Some companies are starting to sell jigs equipped with these hooks. You can find some on Sportsmans Direct. Because of the multiple angles on these hooks, you are able to adjust how your plastic is set. At times, you can entice more fish to bite by setting the plastic in a slightly more vertical mode than plain horizontal. Another benefit to these hooks is they are less likely to be spit as you are reeling the fish in because of the angle. It wedges in better because of its sharper bend. Another good option for fishing plastics through the ice is on a dropper chain below a Hali or some other kind of flasher. If you don’t like using a chain, you could tie up your own mono leader. 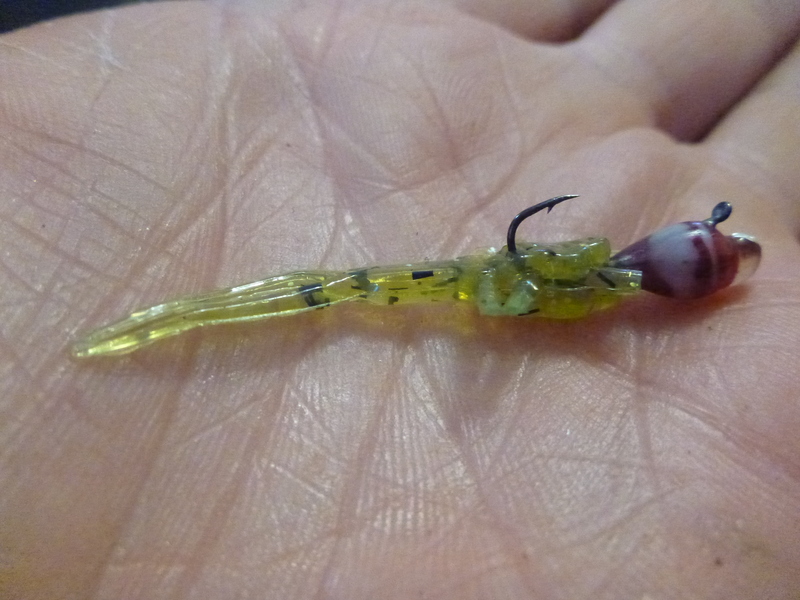 The plastic below is the equivalent to a “senko” but for perch. 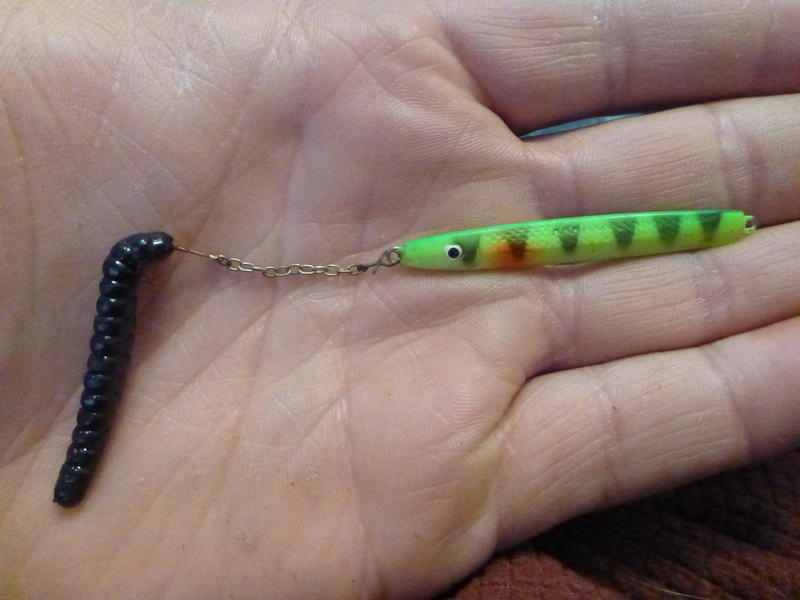 Many times during the summer months I find that bass get accustomed to a weedless rigged straight worm. So what do I do under these conditions? Well I rig it “whacky” of course. 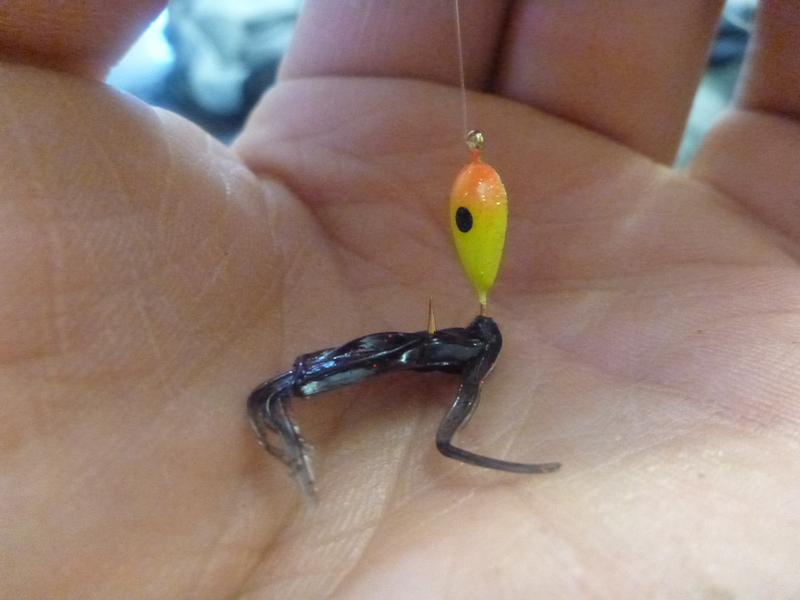 This method means simply to hook the bait directly through the center. When in action, the bait flaps and creates quite a disturbance. It is still possible, even with a larger bait, to rig it horizontally. The bite will determine which strategy I use for the day. When running a larger bait below the Hali, I will often tie on my own hook in larger size for a better hook up percentage. 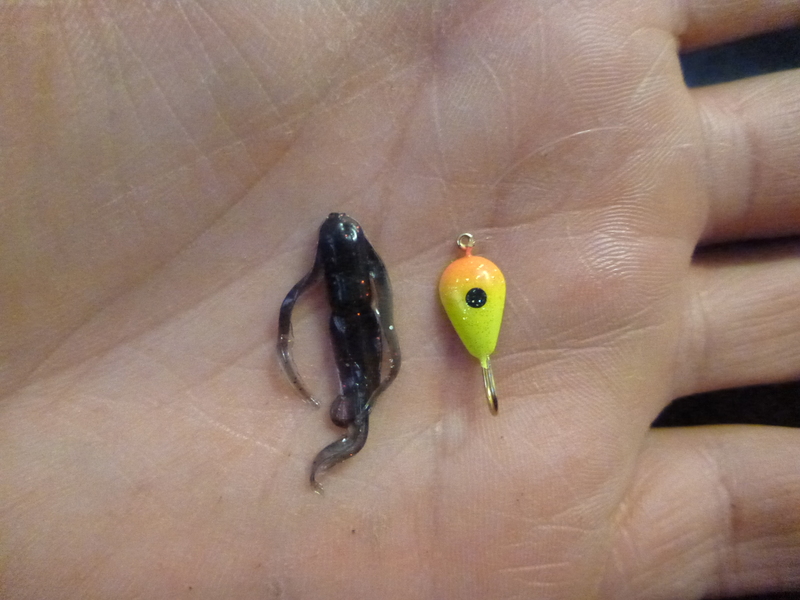 Sometimes I fish baits that are much larger than what I can match up with any hook size I have. In these cases I will still rig the bait in a horizontal position but I will hook more towards the center than through the head like I normally would. This method comes in handy when the fish are biting the tail of a bait as it puts the hook closer to their mouth. 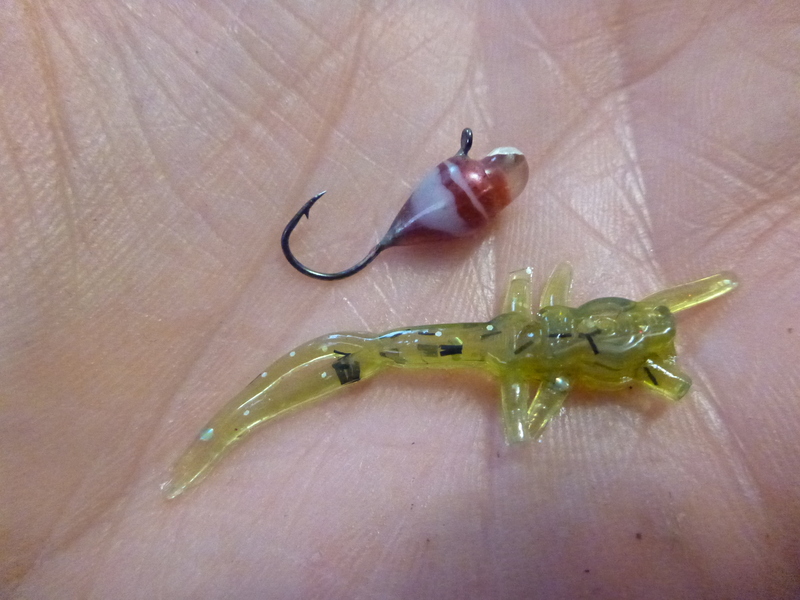 Below, is a good example of the options on rigging a larger bait. This is a plain horizontal rigging. Works well when the fish are committed to biting. 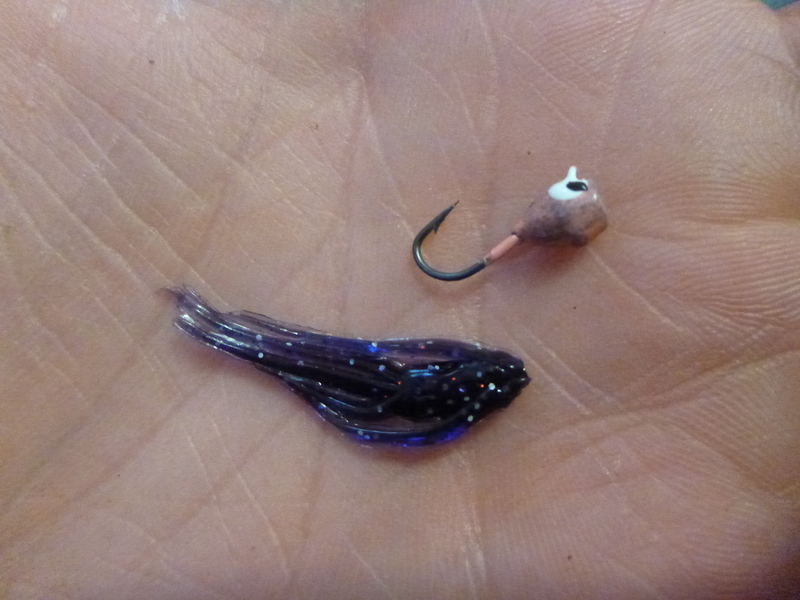 I have had luck using this bait during the summer months for trout in streams as it resembles a stonefly. By hooking the bait more towards the center, you bulk up the head of the bait and put the hook closer to the fish. This has been a very effective method in deep water situations such as the glory hole. Probably my most productive bait this winter was anything vertical by Caty Jigs. I used willows, tears, rodents, and rockers with great success. I went through phases where I like using maggots but the majority of the time I was running plastics. I did find that the fish were more picky as to how the bait was positioned on the hook when rigged on a vertical jig. It needed to be perfectly horizontal or else the bite was slower and only the really aggressive fish bit. 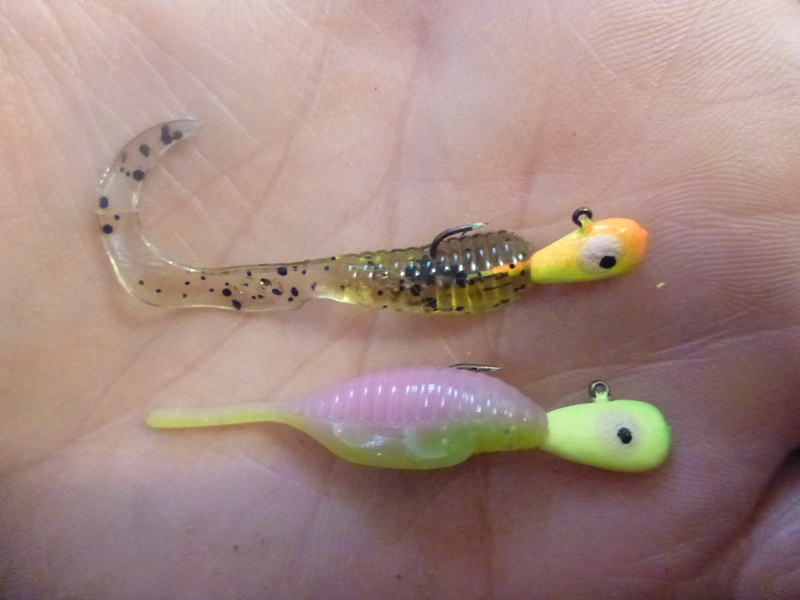 Lately, through the open water, the two baits below have been the most productive options in my box. Rigged just how you see, they have caught just about every fish within the past two weeks. Quite possibly the best colors as well. When I open up my tackle box for plastics, the majority of what I own is made by Maki Plastics. The selection below offer just about every option you could need for both hard and soft water. Although I have just about every bait pictured below, I find myself using mainly a few. As a starter kit, I would suggest purchasing: Maki, Jamei, Spiini, Guppi, Spiiki, and Mini Draggi. 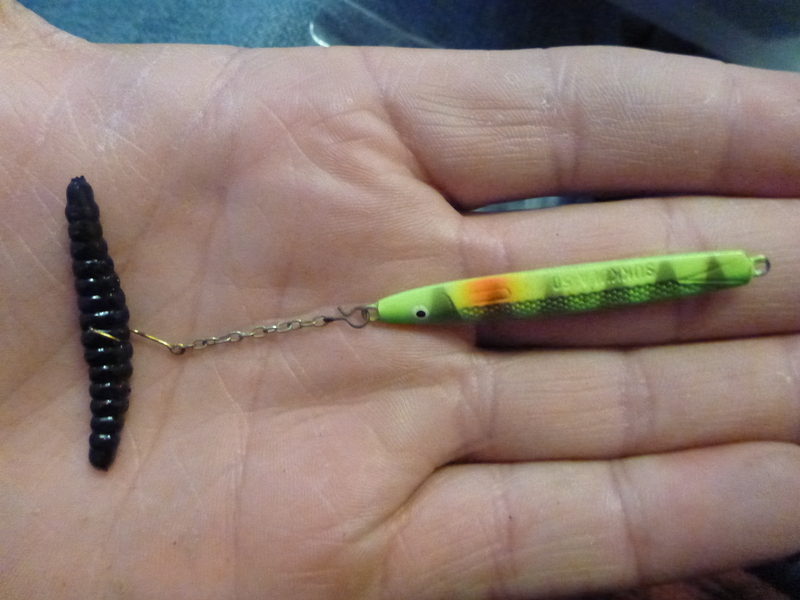 Don’t be afraid to tip your baits with a maggot! Sometimes the fish want a combo of both. Previous PostWe Would Like To Hear From YouNext PostWhere Oh Where Did They Go?. . . . Thanks for the tips, enjoy your blog. Ice fishing is something I have never tried and until recently have not heard a lot about. Im an avid (still crappy) bassfisherman and really enjoy it. How does icefishing compare to bassfishing? I see that the lures are way different but how does it work exactly. You cut or drill a hole in the ice, place your lure down into the water through the hole and wait? I really very interested and apologize as coming off as ignorant (humbly ignorant). What types of fish are normally caught and how is the activity of the fish based upon the coldness of the water? You got it with the ice fishing. Most of us use a flasher unit such as a Vexilar to mark our jig and the fish. We catch every type of fish in the winter that we do in the summer. Cold water species are a little more aggressive in the winter, first and last ice are the best bites for Panfish.